The 10'x12' rectangle has a mat size of 8' x 10'. We made two different models in the 10'x12' size. We also have two different types of fabrics available, the solid vinyl or the black mesh. Both are excellent fabrics. Below is a product description of the difference between the two models and the two fabrics. Two great fabrics, the black mesh or the solid vinyl. Both are excellent fabrics and both are very durable. The solid vinyl is $100 more than the black mesh fabric. 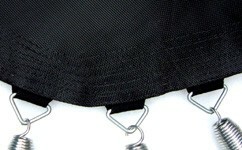 The black mesh fabric is most often recommended for older children and teenagers. This fabric allows air to flow through the fabric which gives a somewhat higher bounce than the solid fabric. It will not pool water in the winter. For water bouncing the kids like to put the sprinkler underneath the mesh fabric. The solid vinyl is a great fabric for younger children. They like to put water on this fabric in the summer for water bouncing . It does tend to pool the water in the winter so the mesh is sometimes preferred for this reason. We have two different models in the 10'x12' size. The model #120 has a spring count of 21 on the ends and 27 on the sides. We call it the model #120 or (21/27) When you look at this trampoline mat it looks like the springs are grouped closer together in the center of the mat a further apart towards the corners. The model #125 has a spring count of 22 on the ends and 27 on the sides and the springs are evenly spaced along the entire edge of the mat.